When fully loaded with cargo, big rigs, 18-wheelers, semis, tractor-trailers, and other large commercial trucks can weigh up to 20 times more than the average passenger vehicle. Considering the significant disparity in size and weight, it's no wonder that when collisions between large trucks and passenger vehicles occur, the occupants of smaller, lighter-weight vehicles are likely to suffer the most severe injuries and losses. Read on to learn about some of the most common truck accident injuries, and what to do if you were hurt in a crash caused by a commercial driver or trucking company's negligence. The medical complications of vehicle crash injuries are magnified after a truck collision for one good reason: the lack of structural protection against great force. This leaves people in passenger vehicles more vulnerable in many ways. Cuts, heat or chemical burns, and abrasions may seem like relatively minor truck accident injuries. However, in addition to being extremely painful, these injuries often require extensive medical treatment, and can even result in permanent scarring or disfigurement. Truck collisions can result in severely broken or even crushed bones. To ensure proper healing of broken bones, they may require surgical intervention to secure wayward pieces. The process for repairing crushed bones can be even more complicated and may necessitate extensive surgical reconstruction efforts. Head injuries are one of the most serious types of injuries a truck accident victim can sustain, as even relatively minor trauma to the head or brain has dire consequences. Common truck crash head and brain injuries include skull fractures, concussions, and moderate-to-severe traumatic brain injuries (TBIs). Concussions usually heal with time and rest, but sustaining multiple concussions can cause dementia-like symptoms. TBIs often leave victims with lasting physical, cognitive, behavioral, and communicative impairments, and may prevent them from being able to hold a job or care for themselves. The soft tissues in the neck, back, and shoulders take a beating in a truck accident, resulting in debilitating pain and reduced movement. Truck crash victims may suffer from torn ligaments, herniated discs, displaced vertebra, and other injuries. Spinal cord damage is particularly dangerous, as it may cause various degrees of paralysis that's often permanent. Losing an arm or leg can turn an accident victim's life upside-down and force them to relearn how to do simple daily tasks. Unfortunately, lost limbs and amputations are common injuries among truck crash victims. A limb may be severed in the accident, or amputated at the hospital if doctors determine it can't be salvaged. Collapsed lungs occur due to various types of other large truck wreck injuries. Additionally, crash victims may suffer difficulty breathing as a result of inhaling smoke or toxic fumes from hazardous cargo. 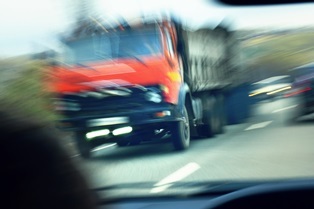 Truck accidents might cause significant psychological trauma. Victims injured in truck crashes may experience severe anxiety or panic attacks in response to the idea of riding in a car again, or suffer from psychological conditions like clinical depression or PTSD. Not all truck accident victims recover from their injuries. When someone dies in a truck crash that wasn't their fault, certain surviving family members may be eligible to file a wrongful death claim to seek compensation for injuries and other losses related to their loved one's death. Georgia wrongful death claimants can pursue damages for the victim's lost wages and benefits, care and companionship, and medical expenses. They may also seek reasonable funeral and burial expenses, and pain and suffering damages. If you were hurt or lost a loved one in a Georgia truck accident, you might be entitled to financial recovery for medical expenses, property damages, lost wages, pain and suffering, mental anguish, and other damages. However, there's too much at stake to go up against practiced corporate attorneys on your own. The experienced personal injury attorneys with Van Sant Law will investigate your case, help you understand your rights and options, and fight for the settlement or financial award you deserve. Contact us today to schedule an appointment for a free initial consultation to discuss the details of your case with a member of our legal team.